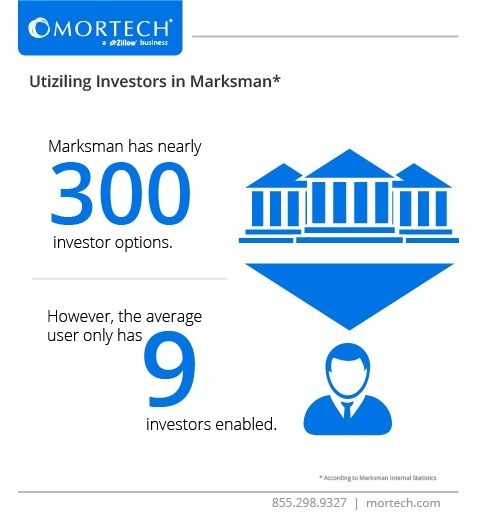 Mortech provides our complete pricing for nearly 300 investors within Marksman, allowing our customers to view and compare rates among their investors and ensure they’re always providing the best product for the right loan scenario. However, many lenders aren’t maximizing the effectiveness of their investor options. By utilizing more investors, lenders can provide their borrowers with better, more competitive rates. Despite pricing for nearly 300 investors available within Marksman, the average lender only utilizes nine investors in their Marksman account, limiting the number of products and rates they can offer borrowers. This can provide a limited borrowing experience for your customers, and gives you less options when searching for just the right product for them. Mortech makes it easy to enable investors, and ensure that comparison doesn’t get more difficult with more investors added. With the touch of a button, lenders in our mortgage pricing engine can view and compare rates from all of their enabled investors, with added profitability options to not only easily view these rates, but decide which product is the most profitable, and provides the borrower with the best experience. Wondering how you can enable more investors in your Marksman account? Contact your account manage to find out how you can get setup with more investors to compare and provide your borrowers. Or, if you’re looking to get a Marksman account to access our database of investors, you can contact us for a short, free demo today.